A secure platform with high availability and geo-redundancy, offering compute power and storage in Infrastructure as a Service (IaaS) and Software as a Service (SaaS) models. Our cloud platform is easily accessible from anywhere and any device from around the world, supported by Service Level Agreement and 24 X 7 customer support. Installation, maintenance, and change management of the physical infrastructure and data center will be managed by Brilliant. Controllers, Hypervisors, Storage and Network devices are secured and can be reliably utilized with a minimum amount of down-time. Upgrade, downgrade of VM specs based on customers’ requirements at point of time. Brilliant Cloud Datacenter is located in Dhaka. Users can connect to the Cloud over Internet from all over the world and as well as over local bandwidth. Our Cloud is located within our own ISP network with high-speed connectivity with BDIX and NovoNIX (one and only private owned IX in Bangladesh). Users within Bangladesh will experience latency in the range of 5-10 msec. Clients will be able to choose their required VM configuration from our variety set of packages. As Brilliant Cloud is a locally hosted infrastructure, payments can be done in Bangladeshi currency i.e. Taka for Bangladeshi clients. Network firewalls will provide full security to the Cloud infrastructure. Customized security policy can be created for client’s VM through Openstack security group. Data encryption will be provided while transferring to storage devices and Cluster-level encryption while at rest. Cloud adoption cut energy use and carbon emissions in comparison to on-premise IT infrastructures. Dematerialization or the substitution of high carbon physical products with virtual equivalents and activities helps to improve energy efficiency. We have industry standard power backup. Redundant switches and routers, ensures node level redundancy. The physical servers are behind private networks. Unauthorized access controls are strictly monitored and 24X7 on-site maintenance personnel are on duty. 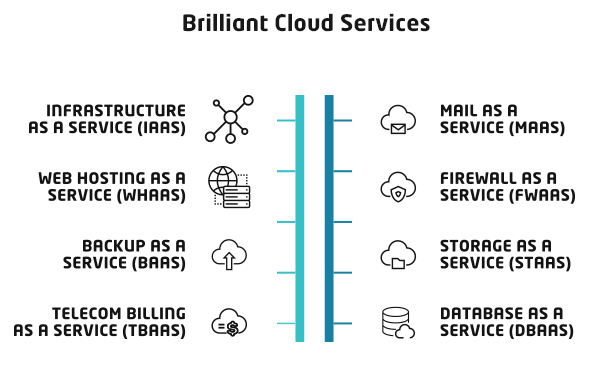 Brilliant offers a self-care portal named Cloudform, for clients to manage the cloud infrastructure. Clients can seamlessly add, remove, upgrade, downgrade or monitor their resources from the resource pool. Clients can manage resources in other Global Cloud service platforms such as AWS, Microsoft Azure, Google using this portal. Brilliant Cloud’s Disaster Recovery (DR) is in Jessore for Bangladesh. Both the DC & DR are well equipped with industry standard power and power backup, racks, servers, network switches and routers with proper physical security.